International Journal of Research in Health Sciences,2014,2,1,30-35. 1Psychiatrist, Composite Hospital, Group Centre, Central Reserve Police Force, Bantalab, Jammu, Jammu & Kashmir, INDIA. 2Reader, Dept of Community Medicine, Armed Forces Medical College, Pune – 411040, Maharashtra, INDIA. Background: Although Punjab, India, is a prosperous state, yet there is a large number of youngsters migrating to foreign countries. In view of the increasing number of younger people migrating to foreign countries, leaving behind the elderly, the present study was undertaken in a rural area of the state of Punjab, India, to get an insight into the mental health of the elderly people at the receiving end of this exodus. Materials and Methods: Cross sectional, descriptive, community-based study. 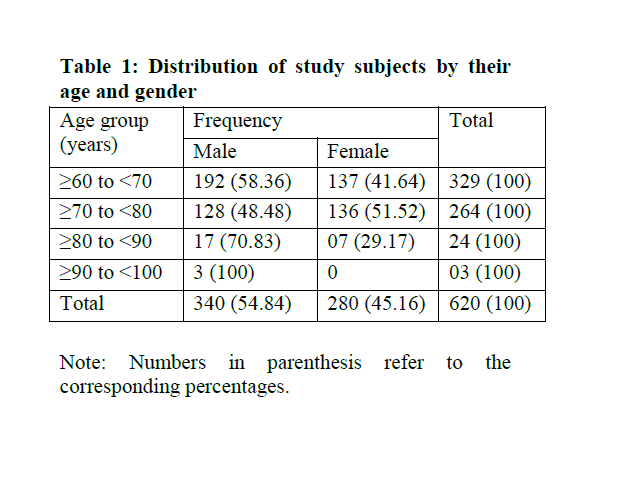 Results: Maximum number of the study subjects were from the age group ≥60 to <70, i.e., 329, while men formed majority of the study population (54.84%). Depression was prevalent in general, in the study population. Conclusion: Reasons for migration are varied: unemployment, general attitude of these youth that migration to other countries is the best alternative, potential migrants consider other successful migrants as their role models. In the bargain, they leave behind the elders in the family. This takes a toll not only on the physical health of the elderly, but also their mental health in the form of loneliness, dementia and depression.